The concept of the “twin” or even “divine twin” is a common one that also appears in antiquity. This is a notion that a person has within a transcendent dimension, or a “heavenly counterpart”, or what in various modern magical “secret” orders call the “Holy Guardian Angel”. This being is analogous to the “daimonic”, “Eidolon” double of Greek and Platonic literature. The twin concept can also be seen in the dichotomy between Simon Magus and Paul, Simon Magus with Peter in the Clementine literature, as well as the struggle between Paul and Peter in the epistles. Even in the Old Testament, we have Cain who slays Abel which echo the Roman-Sabine legends of Romulus and Remus, Egyptian ones like Osiris and Set, the astrological sign of Gemini, as well as the Greek Castor and Pollux. Such statements indicate a sort of panspermatic type of panetheism, similiar to what is found in Manichaean texts of the countless, innumerable light sparks of the First Man who would battle against the primeval forces of Darkness. These light sparks were said to be interspersed throughout the wicked cosmos, much like how it is described in ancient Orphic texts with Zeus exacting revenge against the murderous Titans who tore and consumed the body and limbs of Dionysus. Both of these cosmological stories echo the ancient Egyptian myths of Osiris depicted as a divided god, murdered and torn apart by his brother Set, the god of storms and foreigners, only to be restored again by his consort Isis. In this instance, we find the primordial, violent origins of mankind and his conflicted nature: one being the divine Dionysus, and the infernal Titanic elements being his flesh. “(The Lord), talking to me, said: I am thee, and thou art Me; wherever thou art, there I am. I am sown everywhere” (Gospel of Eve, Erbetta, p. 537 – Bibliogaphy). The words “sown everywhere” of the latter quotation is very important, for it corresponds to a fundamental Valentinian teaching. Each soul’s substance comes from Sophia, but its living Center, the Spirit, is a fragment, as it were, of the very Life of the Son as Christ. This fragment is called either “Spark” or “Seed”. “After the psychical body had been formed, a male Seed was placed by the Logos in the chosen sleeping soul. That Seed is an outflow of the Angelic Being, so that there would be no Lack (Hystérëma).” (ExTh 2: 1). In any case, the rest of the Gospel of Thomas is just as enigmatic if not down right bizarre, even for Biblical standards (and there is certainly weirdness abound in the traditional canon). It is true without lie, certain and most true. What is Below is like that which is Above. And that which is Above, like that which is Below, serve to bring the wonder of the Universe into existence. And as all things originate from One thing, from the Idea of One Mind: so do all created things originate from this One thing through adaptation. Its father is the Sun, its mother the Moon. The Wind carried it in its belly, its nurse is the Earth. It is the father of all existing things in the entire Universe. Its inherent virtue is perfected when it is changed into Earth. Separate the Earth from the Fire, the Subtle from the Gross, repeatedly with great skillfulness. It rises from Earth to Heaven, and falls back down again to Earth, thereby containing within itself the powers of both the Above and the Below. Thus will you obtain the glory of the entire Universe. Every darkness will leave you. This is the greatest strength of all, because it conquers every subtle thing and penetrates every solid thing. In this way, was the universe created. From this proceeds wonders, of which herewith is an example. Therefore, I am called the three-times glorified Hermes, because I possess all three parts of true understanding of the whole Universe. What I have had to say about the operation of the Sun is completed. What is amusing to see is how not only does Jesus and Hermes seem to be espousing the exact same doctrine but in that Christ is being somewhat more explicit in his use of Hermetic language than even old Hermes himself, the spiritual father of the alchemical and occult arts and sciences. What is quoted above reads very similar elsewhere in Thomas, such as “Perhaps people think that I have come to cast peace upon the world. They do not know that I have come to cast conflicts upon the earth: fire, sword, war,” and this one, “I have cast fire upon the world, and look, I’m guarding it until it blazes.” All of this sounds a lot like what Hermes describes as “Separate the Earth from the Fire, the Subtle from the Gross, repeatedly with great skillfulness”. Judas Thomas even goes as far to say that, “Whoever discovers the interpretation of these sayings will not taste death.” Strong words! The death that is being emphasized here is spiritual death i.e. ignorance or what the Gospel of Truth calls “oblivion”. Mani, like Thomas in those same Acts which include the Song of the Pearl, has Christos Angelos as his heavenly Twin, who informs him of his vocation, just as the prophet Mohammed was to receive the revelation from the Angel Gabriel (and the identification Christos-Gabriel is by no means unknown in gnosis.) Now, Christos Angelos is the same in relation to Mani (in eastern Manicheism the Virgin of light is substituted for Christos Angelos), as is the taw’am, the “Heavenly Twin,” in relation to each of the Elect respectively and individually. Much like Thomas being the twin of Jesus, Hermes was the Greek personification of Djehuti or Thoth; here we see an older order of things taking on a new raiment but underneath the same old meanings. Thoth was one of the earlier Egyptian gods, thought to be scribe to the gods, who kept a great library of scrolls, over which one of his wives, Seshat (the goddess of writing) was thought to be mistress. He was associated by the Egyptians with speech, literature, arts, learning. Even the very word “thought” comes from the name Thoth. He, too, was a measurer and recorder of time, as was Seshat, the female counterpart to Thoth. Believed to be the author of the spells in the Book of the Dead, he was a helper (and punisher) of the deceased as they try to enter the underworld. In this role, his wife was Ma’at, the personification of order, who was weighed against the heart of the dead to see if they followed Ma’at during their life. It is interesting that the word “Ma’at” is the Egyptian equivalent to wisdom or philosophy. Thus “Philo” is related to feelings of love while “Sophia” is also wisdom thus we have “Philosophy” which actually means the “Study of the love of Ma’at”. The word “matrix” comes from Ma’at (the feminine principle, synonymous with Isis, the progenitor of life) Ra (the Egyptian sun god) X (Roman numeral ten) as well as “mother” and “womb”. To see through the Matrix is to be born again (using Johannine language), to be given a rebirth from darkness to light. I have arranged the whole year. And from the year I calculated the months, and from the months I have ticked off the days, and from the day I have ticked off the hours. I, I have measured and noted the hours. And I have distinguished every seed on the earth, and every measure and every righteous scale. I have measured and recorded them. Thoth, here, represents the heart and tongue of Ra, reason and the mental powers of the god and the utterer of speech. Thoth also resembles the Gnostic Aeons like Autogenes, in how they are “thought” of as “self-generated”. This is why Paul in Acts 12:14 is called Hermes, “because he was the chief speaker.” It has been suggested that Thoth is thus the equivalent of the Platonic Logos. 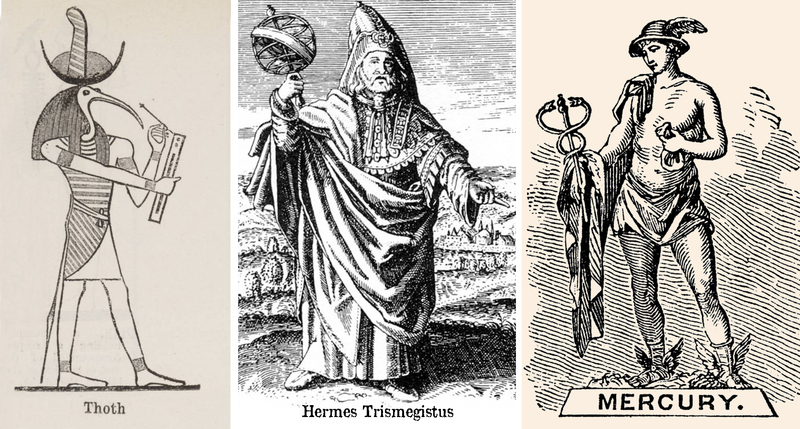 Many are his epithets: his best known being “thrice greatest”—in later times becoming Hermes Trismegistus as mentioned by the Emerald Tablets of Hermes. The title “thrice great” or “three times blessed” recalls the concept of the Trinity, and even the doctrine of the three natures. The three natures doctrine was regularly espoused by Jesus in the Parable of the Sower in Matthew 13 and Paul in his epistles. Simon Magus is called the “Great Power of God” in Acts 8:9 and is said to be the author of the Great Announcement as quoted by Hippolytus in the Philosophumena or Refutation of All Heresies. Later Gnostic literature like The Three Steles of Seth and the Trimorphic Protennoia otherwise known as The Three Forms of Forethought use this title many times. Even in Hindu literature, does the three natures doctrine appears in the form of the “sattvas”, “rajas” and “tamas” as explained in the Bhagavad Gita. Thoth is the inner spiritual recorder of the human constitution, who registers and records the karmic experiences and foretells the future destiny of the deceased, showing that each person is judged by himself– for Thoth here is the person’s own higher ego; as regards cosmic space, Thoth is not only the cosmic Logos, but its aspect as the intelligent creative urge inherent in that Intelligence. Since Thoth was the god of wisdom, and espoused knowledge along with wisdom, this moon deity was balanced. When one dispenses knowledge without the wisdom of speaking at appropriate times, they are considered a blabber mouth. Patience is born out from wisdom. With the application of wisdom and self control, we learn to not to be bedazzled or blinded by this new found light of knowledge and learn to discern what his helpful to our growth and what is merely entertaining. This is when consciousness begins to expand. With wisdom, one can seek to counsel with both the ignorant and the learned just as Jesus did with those considered as the “dregs” of society, such as prostitutes, the blind, the lame and even lepers in the Gospels. Sitting at the base of the spine is the reptilian brain or what scientists today identify as the R-Complex. It is the part of us that deals fight or flight, fear, aggression and survival of the fittest. Thoth was associated with the bird Ibis; thus the wisdom of the Ibis swallows up the reptile and wisdom over powers aggression and knows when to strike. Thoth is considered the hand and voice of “God” and a counselor of the divinities. The word “Yod” from the Kabbalah (which means to receive) is the Hebrew word for “hand”. The Yod is also the letter for the number ten associated with the Jewish deity Yahweh or in the Chaldean and Gnostic variant IAO. Hail to thee, great God, Lord of the Two Truths. I have come unto thee, my Lord, that thou mayest bring me to see thy beauty. I know thee, I know thy name, I know the names of the 42 Gods who are with thee in this broad hall of the Two Truths . . . Behold, I am come unto thee. I have brought thee truth; I have done away with sin for thee. I have not sinned against anyone. I have not mistreated people. I have not done evil instead of righteousness . . . I have not reviled the God. I have not laid violent hands on an orphan. I have not done what the God abominates . . . I have not killed; I have not turned anyone over to a killer. I have not caused anyone’s suffering . . . I have not copulated (illicitly); I have not been unchaste. I have not increased nor diminished the measure, I have not diminished the palm; I have not encroached upon the fields. I have not added to the balance weights; I have not tempered with the plumb bob of the balance. I have not taken milk from a child’s mouth; I have not driven small cattle from their herbage… I have not stopped (the flow of) water in its seasons; I have not built a dam against flowing water. I have not quenched a fire in its time . . . I have not kept cattle away from the God’s property. I have not blocked the God at his processions. The voice of God as we found out earlier is known as Metatron in the 1 Enoch and Kabbalistic sources. Enoch-Metatron also have strong parallels with Hermes-Thoth as well. Most importantly, Thoth was a clerk of the Halls of Judgment and named a means for it called the Scales of Thoth, where the heart of the initiate is weighed against a feather “of Truth” to find how truly “heavy or light” it is. It is Thoth who equips the dead with efficacious means of protection against the dangers of the Beyond. When the dead has to enter into the presence of the Great Tribunal of the gods, Thoth leads him in, makes pleading for him with the Judges, weighs his heart in the scales against the feather of Ma’at, and, in the end, records the verdict. The details of all this ritual and ceremonial are familiar in the literature of the Book of the Dead: What Thoth once did for Osiris, the same must he do for every dead Egyptian since the Osirian ritual was the standard and guide for all funerary ritual in Egypt. The priests who took part in funerary celebrations regarded themselves as incorporation’s of the Osirian gods. The Book of the Dead make several allusions to mortals achieving immortality or divinity through theurgy and funerary magical ritual. 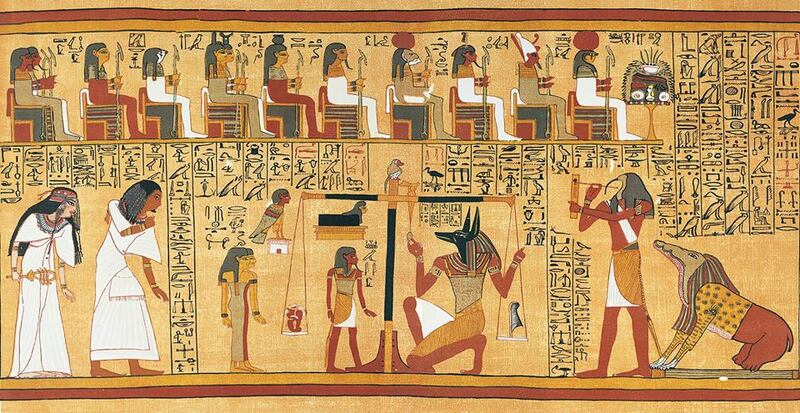 Osiris, the divided and resurrected god of the underworld is also portrayed as one of these judges of the afterlife. 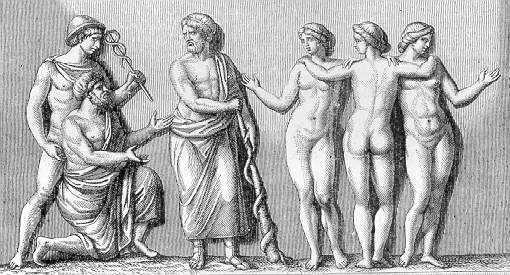 And so, Asclepius, what a great miracle is man, a being worthy of reverence and honor. For he passes into the nature of a god as though he were himself divine; he is intimate with the order of daemons, knowing that he is sprung from the same origin; he despises that part of his nature which is human, for his hope is in the divinity of the other part. And as Moses lifted up the bronze snake on a pole in the wilderness, so the Son of Man must be lifted up, so that whoever believes will in Him have eternal life. The speculations concerning the Christian Trinity were dangerously close to the speculations about Asclepius, who was third from Zeus, the second being Apollo. 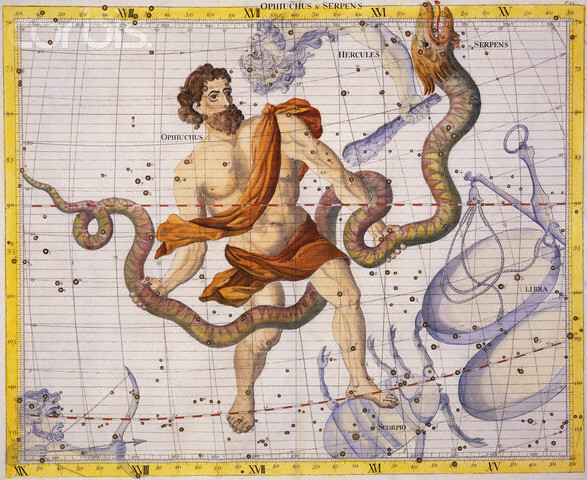 The syncretic god Serapis was also considered synonymous with Asclepius and was even depicted as a snake, with the head recognizable as Serapis. Serapis was also associated with Osiris, Isis and Harpocrates. Could these references of Jesus and Moses being connected to serpents also reflect that they may also be associated with the Serpent in Genesis and the Garden of Eden? Furthermore, could the Gnostic-Ophite and Manichaean speculations of the Serpent being sent by Sophia or even Jesus “the Splendor” be based in scripture and not just in speculative inverted fancy? 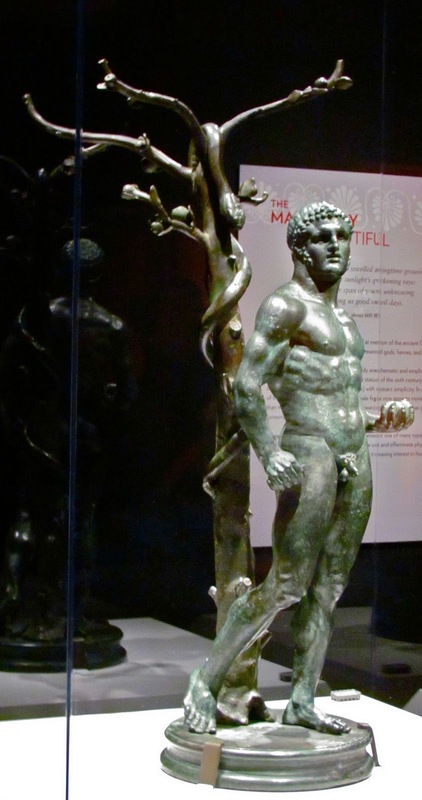 There are paintings, sculptures and vase etchings that depict the eleventh labor penance for the demigod Hercules, who stands next to a tree with a serpent named Ladon, guarding the golden apples of immortality, in the Garden of Hesperidies, tended by maidens and nymphs. This recalls the stories of Genesis 3 and even Gilgamesh, both of which include the legendary search for immortality associated with a serpent. This also has strong applications to the Caduceus, the twin snake staff of Hermes. This also relates to Agathosdaimon, the “good spirit of abundance” and Tyche Agathe, the first of which was associated with the Orphic Deity Phanes Protogenos. 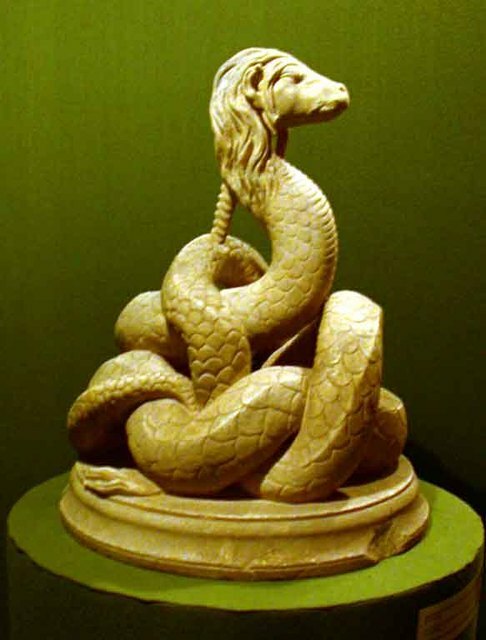 Agathosdaimon was also portrayed as a serpent in coins, monuments, figurines, reliefs, lamps, etc. 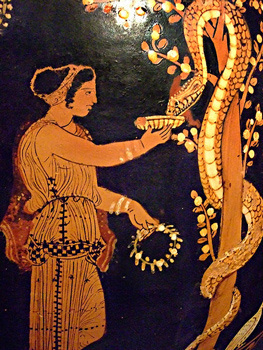 Glykon was also depicted as a serpent with a human-like face. In the writings of the satirist Lucian (Alexander the False Prophet 24), we see the con-man Pseudo-Alexander, who claimed that the made up serpent god, Glykon was a reincarnation of Asclepius! This, of course, was a parody of Agathosdaimon, Asclepius as well as Serapis. Glykon could may also be a parody of the lion-headed serpent, Ialdabaoth. By now he was even sending men abroad to create rumours in the different nations in regard to the oracle and to say that he made predictions, discovered fugitive slaves, detected thieves and robbers, caused treasures to be dug up, healed the sick, and in some cases had actually raised the dead. For law is the child of justice, the sacred and truly divine adjunct of the most might god, and never will the man who is wise make light of it or set it at naught. But since all that he does will have justice in view, he will be eager to honor the good, and the vicious he will, like a good physician, make every effort to cure. In this likening himself to a physician, he may not have intentionally recalled Asclepius, Julian was relatively unpopular, especially with the Christians. By employing a figure like Asclepius, a benevolent and universally loved healing figure of the pagans, Julian found a suitable rival to that of Jesus Christ. Celsus in Contra Celsus by Origen, provided a similar polemic against the Christians, like Julian, who believed the Christian religion destroyed the foundation of Greco-Roman tradition and culture. Julian like Celsus argued against the Christians and that of Christ’s miracles in which he regarded as inferior and the work of a low-class magician, no better than the phony charlatan religion ascribed to Glykon and his prophet, Alexander. Asclepius, having made his visitation to earth from the sky, appeared at Epidaurus singly, in the shape of a man; but afterwards he multiplied himself, and by his visitations stretched out over the whole earth his saving right hand. He came to Pergamon, to Ionia, to Tarentum afterwards; and later he came to Rome. And he travelled to Cos and thence to Aegae. Next he is present everywhere on land and sea. He visits no one of us separately, and yet he raises up souls that are sinful and bodies that are sick. Celsus makes a biting critique of the Christian doctrine of Jesus or the “Word being made flesh” and also strangely mirrors of Julian’s remarks of Asclepius “multiplying himself” to “raise up souls that are sinful and bodies that are sick”. Again, if God, like Jupiter in the comedy, should, on awaking from a lengthened slumber, desire to rescue the human race from evil, why did he send this Spirit of which you speak into one corner of the earth? He ought to have breathed it alike into many bodies, and have sent them out into all the world. Now the comic poet, to cause laughter in the theatre, wrote that Jupiter, after awakening, despatched Mercury to the Athenians and Lacedaemonians; but do not you think that you have made the son of God more ridiculous in sending him to the Jews? Celsus also describes the ancient Christian cult as a diabolic secret society made up of sorcerers! It is by the names of certain demons, and by the use of incantations, that the Christians appear to be possessed of miraculous power. And it was by means of sorcery that Jesus was able to accomplish the wonders which he performed; and foreseeing that others would attain the same knowledge, and do the same things, making a boast of doing them by help of the power of God, he excludes such from his kingdom. This is, of course, very similiar in how the Church Fathers like Ireneaus in Against Heresies, describe Gnostic heretics like Simon Magus, Marcus the Magician, and Carpocrates, who were all said to use love charms, familiar spirits, demons, and dream-senders. All were different classes of daemon. Hippolytus repeats the claims about Simon Magus in his 6th book in Refutation of All Heresies. Origen even accused the Persian Magi of using familiars as well. By the Middle Ages, witches were accused of summoning demons to aid them in their practice of and skillful progression in magic ritual. Cunning folk were said to summon fairies to work for them. Some witches’ familiar spirits were animals as in ancient Greek tales. For the most part, the magicians would try to convince the power of a god to work for them, while the daimon would be something the magician would absorb and own at will. A daemon was seen as a demigod–an independent and immortal being, but not as powerful as the great gods of the official national cults. In Roman terminology an entity similar to the daimon was the genius–a familiar spirit inherited along genetic lines in the family or gens. The genius in Roman culture was the soul of a person that guided their actions and dictated what they were good at or destined to do. There were good demons and bad demons. The good was the “noble spirit” or agathosdaimon as mentioned earlier, and the bad was a “malevolent spirit” or kakodaimon. As far back as we can trace in Greek mythology, the daimon was a good force while the keres is the early form of the kakodaimon, which flew out of Pandora’s box. For Plato and Socrates, the daemons were the spirits of Atlantis. 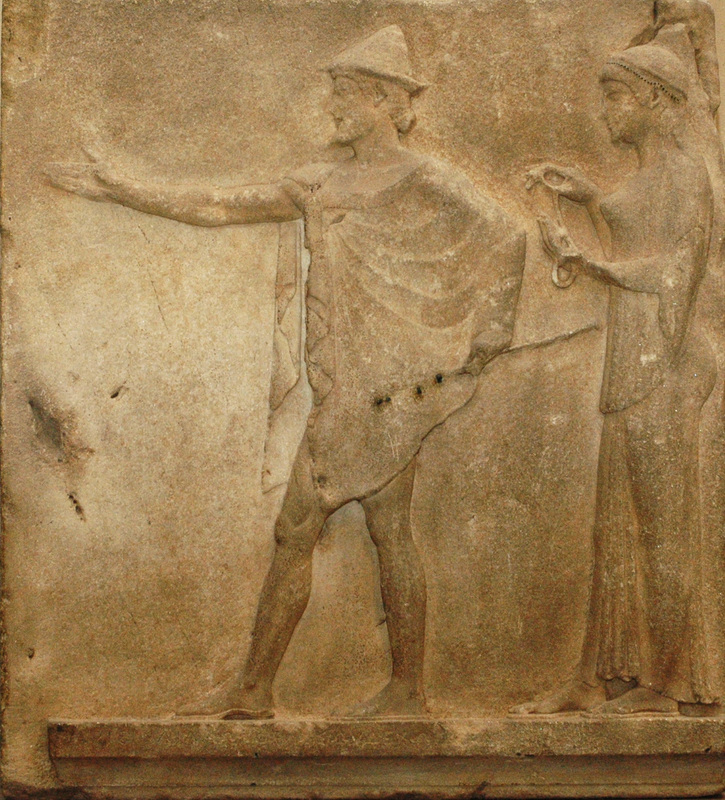 In the Symposium, the wise priestess, Diotima tells Socrates that the daemon acts as an intermediary between gods and men, existing in an intermediate state or nature. This is like Hermes, the messenger of the gods, or Thoth. In Dionysian rituals, wine was drunk in propitiation ceremonies much like the Eucharist, to the genius of the dead. In the fictional best selling trilogy His Dark Materials by Phillip Pullman, daemons are undoubtedly an element which make his story leap off the page and stick with its readers. In the story, everyone has a daemon. They are the person’s soul in animal form, a shape-shifting companion who eventually settles into one form to symbolically represent their personality. In Germany, the doppelganger was said to be the harbinger of death and the double of a person. In ancient Egypt, the Ka or “Twin Soul” was much like the genius or double. The Jews saw this as idol worship and when the LXX was translated from Hebrew in to Greek, the word for idol was changed to demon. The Jews thought that men were being worshiped when in fact, men were revering the inner divinity that was in them but outside and separate from them. This same concept appears in the Gospels of Luke and Thomas when Jesus speaks of the kingdom of God being inside of us and in the Gospel of John and the Psalms of David when it says, “ye are gods”. As time wore on, the demon took on negative connotations in 4th century Christianity as well as early Islam. The Satan or Jinn figure was a fiery demon that one made a bargain with in order to receive a certain desire or wish and gave up their soul (genius?) in the process. Plato speaks of the daemon of Socrates in the Symposium, Phaedrus, Cratylus, and the Apology of Socrates as a mostly positive figure that helped Socrates with mundane things. Hesiod and Homer spoke of the daimon as well. Even the books of Judges and Kings in the Bible have a familiar spirit of Samuel which is not a ghost either. The agathosdaimon by the mid third century in the time of Origen and Tertullian, was now seen as the guardian angel and Simonians were accused of worshiping angels, which is the very thing they were actually against! These angels were associated with the stoicheia, or the elemental powers i.e. “four elements” that Paul warns against worshiping in Galations 4:3,9 and Colossians 2:8,20. In fact, Paul equated the Greek and Roman gods with these daimons, which he considered to be lesser and potentially malevolent beings of the lower realms of the cosmos (1 Corinthians 10:20). The first thing the converted Gentiles needed to do, according to Paul, was to stop worshiping these beings and stop participating in Greco-Roman sacrifice, which in itself was a hugely radical statement since sacrifice to the gods was such so intimately connected with everyday life! Irenaeus associates these practices such as raising familiars with the art of exorcism, something Jesus is known to have done a lot of. The most famous of which was the raising of Lazarus of Bethany in the Gospel of John. In the Gospels there are about nine major exorcism incidents involving Jesus, and his disciples go on to perform the same miracles in Acts and in the Apocryphal Acts. The very act of exorcism was against Jewish custom and law. It was a Canaanite practice of the witch of Endor which Saul and the Israelites of the North also practiced. Six of the nine exorcisms occur in both Mark and Luke, one only occurs in Matthew, one only in Luke, and one exclusively in Matthew and Mark. There are three resurrection events. One is found in the synoptics (Jairus’ daughter), one in Luke (man of Nain), and one in John 11:1-4 (Lazarus). Note that there are no exorcisms in John’s gospel oddly enough. The Jesus of the synoptics is much more of a miracle working magician as noted many times by the enemies of the Christians in Celsus and Julian. It seems to me that as time wore on magic (both theurgy and goetia) became more hated as women became more looked down upon in the church as testified by Tertullian’s views on women being the “gateway of the Devil”. After all, the greatest magic back then was that of child birth not that of walking on hot coals! The similarities between the story of Ascelpius and the gospel about Jesus are thus undeniable. The promises of health and everlasting life to the Asclepian devotee is similar to the promise made by Jesus Christ in the Gospel of John. This rivalry between the Church Fathers like Justin Martyr and Origen and the pagan philosophers like Julian, Celsus and even Philostratus who wrote about the adventures of Apollonius, explains this tense relationship between the two sides, being Christianity and the ever fading paganism of Greco-Roman civilization. But, according to the Jew of Celsus, countless individuals will convict Jesus of falsehoods, alleging that those predictions which were spoken of him were intended of them. We are not aware, indeed, whether Celsus knew of any who, after coming into this world, and having desired to act as Jesus did, declared themselves to be also the sons of God, or the power of God. But since it is in the spirit of truth that we examine each passage, we shall mention that there was a certain Theudas among the Jews before the birth of Christ, who gave himself out as some great one, after whose death his deluded followers were completely dispersed. And after him, in the days of the census, when Jesus appears to have been born, one Judas, a Galilean, gathered around him many of the Jewish people, saying he was a wise man, and a teacher of certain new doctrines. In the next post, we will explore some interesting parallels between the life of Apollonius and that of Paul and Simon Magus. Stay tuned!